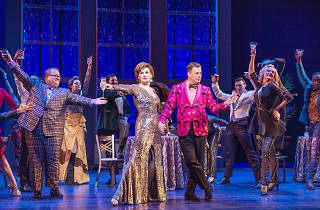 At the opening-night party for an ill-starred Broadway musical, the show’s leading players, Dee Dee Allen (Beth Leavel) and Barry Glickman (Brooks Ashmanskas), are smarting dumbly from a brutal review. She is a grandiose diva prone to sequins and grand gestes, he is a prancing pony “as gay as a bucket of wigs,” and neither of them can understand why they didn’t go over like gangbusters in Eleanor!, a biography of Eleanor Roosevelt. “It’s not the show,” explains their publicist (Josh Lamon). “It’s you two. You’re not likable.” Stung, they resolve to burnish their images through high-profile, low-risk activism. Thus begins The Prom, a sweet-hearted original musical that, despite a few missteps, leaves you grinning by the last dance. Joined by a puffed-up actor-waiter (Christopher Sieber) and a leggy career chorus girl (Angie Schworer, who looks like someone stretched Jane Krakowski on a rack), Dee Dee and Barry decamp—albeit very campily—to rural Indiana. Their goal: to help a local teenager, Emma (Caitlin Kinnunen, a natural actor and wonderful singer), who has been barred from bringing her girlfriend to a high-school dance. Eager for attention, the carpetbagging celebrity protesters come on too strong (“How do you silence a woman who’s known for her belt?” demands the imperious Dee Dee), to the distress of the school’s kindly principal (Michael Potts) and its homophobic PTA leader (Courtenay Collins, drawing blood from a stony role). Backs are raised, pizzazz is shared, egos are deflated and lessons are learned on both sides. It is cheering to see a musical comedy that engages with modern questions, with a teenage lesbian romance at its center to boot. (Emma is secretly dating the overachieving Alyssa, played by Isabelle McCalla.) But while the issues are contemporary, there is a 1980s feel to the character types and the overall style of Chad Beguelin and Matthew Sklar’s score, which resembles their work in The Wedding Singer; a stronger dose of reality in the lyrics and the book (by Beguelin and Bob Martin) would better justify the show’s eventual turn to sentimental education. But Casey Nicholaw’s peppy direction helps give the show enough momentum to power past its narrative potholes and occasional bumps of heavy-handedness. 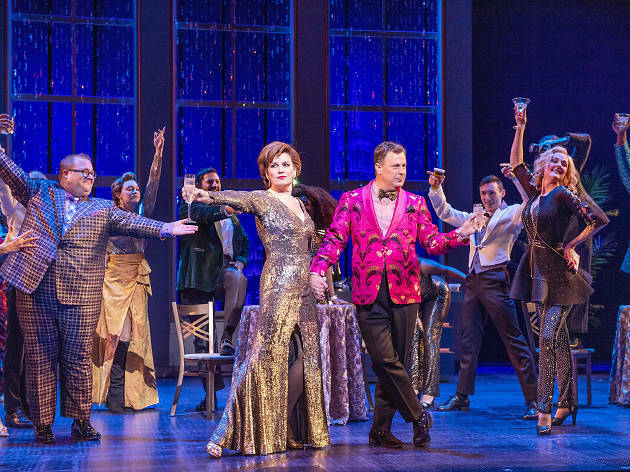 Though it teases Broadway, The Prom has the appealing scrappiness of a party thrown by the theater community for itself, and nowhere is this celebration more joyous than in the deliciously hammy performances of its two seasoned stars, who take over-the-top to dizzying heights. The hilarious Ashmanskas never seems more than a hop, skip and a jump away from actually hopping, skipping and jumping, and Leavel churns her big number, a pastiche called “The Lady’s Improving,” into pure showtune butter. It’s not the show: It’s them. They’re lovable. Longacre Theatre (Broadway). Book by Bob Martin and Chad Beguelin. Music by Matthew Sklar. Lyrics by Beguelin. Directed by Casey Nicholaw. With Brooks Ashmanskas, Beth Leavel, Caitlin Kinnunen. Running time: 2hrs 25mins. One intermission.